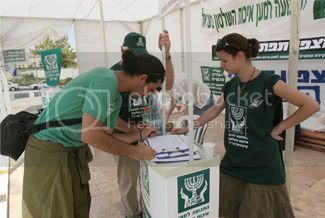 Israeli reserve soldier Aryeh Vider signs a petition near the Prime Minister´s office calling for a judicial commission of inquiry into the war in Lebanon, Aug. 21. JERUSALEM, Aug. 21 (JTA) — Public anger is mounting over the way Israel’s government and generals conducted the war in Lebanon, as reserve soldiers returning from the front tell their stories and demand a thorough shake-up. The dark public mood could lead to the establishment of a state commission of inquiry, which could put the future of Prime Minister Ehud Olmert’s coalition government in jeopardy and see heads roll among the military top brass. The situation is further complicated by the fact that a number of Israeli leaders, most of them in the ruling Kadima Party, have been indicted or are under investigation. Justice Minister Haim Ramon resigned Sunday after being charged with sexual harassment; Tzachi Hanegbi, chairman of the Knesset’s Foreign Affairs and Defense Committee, is to be tried for appointing dozens of political cronies to government jobs when he was a Cabinet minister; Olmert himself, deputy Prime Minister Shimon Peres, Finance Minister Avraham Hirschson and Kadima Party whip Avigdor Yitzhaki all are being investigated for suspected financial impropriety; and President Moshe Katsav is being investigated for suspected sexual harassment. Making things even worse for the current political-military leadership, the Israel Defense Forces’ chief of staff, Lt. Gen. Dan Halutz, has admitted selling stock shares July 12, several hours after the war began. The move raised eyebrows across the country, though it did not involve any insider knowledge or breach of the law. The rising tide of public anger comes as Israel’s political and security problems seem more acute than they have in some time. The military threat posed by a would-be nuclear Iran and its allies looms large — but, at the same time, some voices in Lebanon, Syria and among the Palestinians are calling for a comprehensive peace. But would Israelis trust their current leadership to see them through another war or a major peacemaking effort? Reserve soldiers are taking the lead in public protests against the political and military echelons. One group is demonstrating outside the Prime Minister’s Office, demanding that Olmert, Halutz and Defense Minister Amir Peretz resign. Another group, in a letter printed on the front pages of Monday’s newspapers, accuses the generals and politicians of hesitancy and confusion that, they say, prevented the army from winning the war. The reservists complain that operative plans were continually changed and that the military objectives were not clear. Some reservists complain that the equipment they received was substandard, while others say they fought for days in Lebanon without food or water. Some units said they hadn’t trained properly for years, having been repeatedly assigned to routine duty in Palestinian areas. Part of the problem stems from reduced military budgets and the prioritizing of air power over ground-force needs. These are questions the IDF and any commissions of inquiry will have to address. One commission already has been set up by Peretz, with a brief to look into the army’s shortcomings and recommend solutions. Under a former IDF chief of staff, Amnon Lipkin-Shahak, the commission generally is considered well-equipped for the job. The trouble is that the commission is seen as an attempt by Peretz to pre-empt a full-scale state commission of inquiry, which would be empowered to look into his role as well. The question of setting up a state commission was discussed Monday by the Knesset’s Foreign Affairs and Defense Committee; all its members, except those from Kadima, were in favor. • Did the IDF chief of staff maintain that air power would be enough to win the war in less than a week? Did the prime minister or the defense minister ask the relevant questions? • What was the detailed fallback plan, if the airstrikes did not have the desired effect? • Why did the army not commit ground forces to the areas from which most Katyusha rockets were being fired? • Why did the army wait until the final days of the war before launching a major ground offensive? Who held the ground forces back — the IDF? The prime minister? The defense minister? State commissions after the 1973 Yom Kippur War and the Lebanon War in 1982 had profound effects on Israeli politics and society. The soul-searching in Israel comes as Iran, Hezbollah’s main backer, is moving inexorably toward a nuclear bomb. Moreover, many in Israel believe Iran’s regional ambitions, coupled with the inconclusive results of the war with Hezbollah, will lead to another, possibly much bigger military showdown soon, and argue that the main task now should be preparing the IDF to meet the challenge. But while Arab radicals seem to have concluded from the war that Israel can be defeated militarily, some moderates are pointing in the opposite direction. They say that with Israel less sure of itself, now is the time to make peace. Lebanese Prime Minister Fouad Siniora hinted as much Sunday when he said that if Israel acted wisely, peace could be possible. Some Israelis are contemplating a wide strategic move that would entail peace talks with Lebanon and Syria, in an attempt to detach them from the Iranian axis. Interior Minister Avi Dichter gave voice to this approach when he declared Monday that for full peace with Damascus, he would be ready to return the Golan Heights to Syria. Olmert poured cold water on Dichter’s statement, saying that Syria must stop supplying Hezbollah with rockets before it can become a bona fide partner for peace talks. But the prime minister is serious about exploring peace prospects with Lebanon, where success would enable him to claim that the war paved the way for a major diplomatic gain. One week after the guns fell silent, the situation is fluid. There could be more hostilities, and there could be a significant peace move. Either way, Israel’s current leadership will find itself under growing public pressure to show that it has what it takes to get things right next time — or make way for others who do.